Starring: Melissa McCarthy, Rose Byrne, Jude Law, Jason Statham, Miranda Hart, Morena Baccarin, Peter Serafinowicz, Bobby Cannavale. 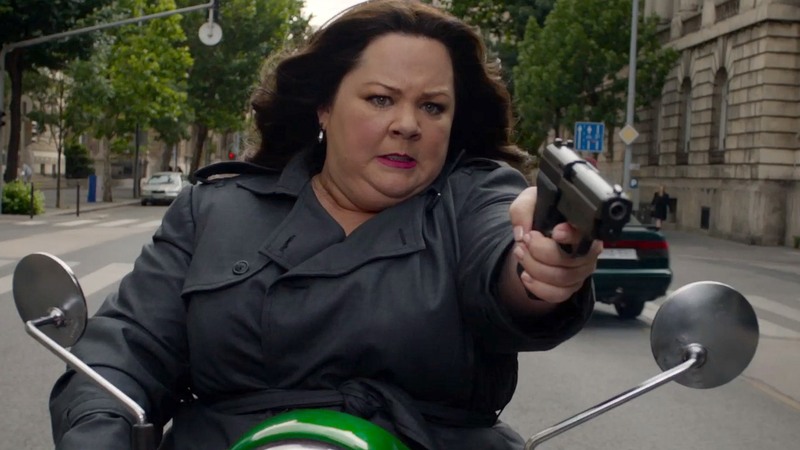 Paul Heig, the director behind BRIDESMAIDS and THE HEAT, brings Melissa McCarthy back to our screens this month for two hours of full-blown entertainment. Melissa McCarthy plays Susan Cooper, a CIA agent who has been side-lined to desk work the likes of Bradley Fine (Jude Law) and Karen Walker (Morena Baccarin), only to be the unsung hero of the department. When a deadly mission takes a turn for the worse, Susan Cooper steps up to the plate to go undercover, as a more unassuming spy than her crazed and intense colleague Rick Ford (Jason Statham), in order to taken down a multi-million dollar nuclear bomb plot lead by Rayna Boyanov (Rose Byrne). Taking the plot into account, one might think that this is a serious CIA blockbuster. Well, this is not the case. SPY takes everything we love about Bond and Bourne films and mixes it with the outrageous comedy of Heig’s previous work, in particular, THE HEAT. Melissa McCarthy is once again brilliant at what she does, blending her quirky and silly humour, initially, as a desk-bound agent, with her intense and offensive comedy when she becomes a field agent. It is a crossover we see in the likes of IDENTITY THIEF (with Jason Bateman), and one which I have grown to love. With McCarthy, every scene is entertaining in one way or another, and who knew she could take on the role of a CIA spy so well. Jude Law is surprisingly not as involved in the feature as the poster and promotion would suggest, but he still adds a great deal of comedy to the feature as a cross between James Bond and Johnny English! Rose Byrne brings her specialty of dry humour to the feature with a brilliant Russian twist. She plays a criminal mastermind surprisingly well (worryingly a little too well) in the feature and keeps the blend of American, British and Australian comedy successful throughout. All involved are great to watch, even Miranda Hart, who I am not usually a fan of, playing Susan’s silly sidekick Nancy. However, there are two men which completely steal the show and every scene they appear in throughout. Jason Statham mocks the “hard-man” status he has built for himself over the years through roles in the likes of TRANSPORTER and CRANK by intensely exclaiming all the dangerous things he has experienced as well as messing up every part of the mission he’s involved with. Peter Serafinowicz (Guardians of the Galaxy, Couples Retreat) plays driver and accomplice Aldo, one of Nancy’s crazy and perverted friends who makes every scene he is in with McCarthy, a piece of comedy gold! Overall, SPY was a pleasure to experience. It had all the action, drama and twists and turns that a secret service film would involve, along with hysterical comedy throughout, from all involved. It was ten times funnier than I was expecting and had me laughing throughout. Ps. An awesome little cameo from 50 Cent!! Recommendation: A definite date night or guys/girls night watch! Side-splitting experience with memorable scenes and worth a trip to the cinema.